Some of my personal favorite hunting stories have stemmed from turkey hunting. Chasing early morning gobbles across Michigan public lands with my brother has produced multiple gut-busting tales I share at hunt camp every year. 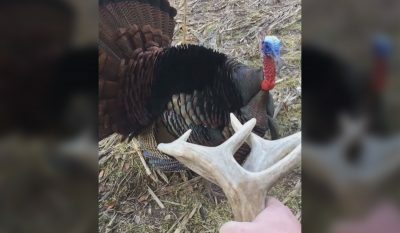 Well, this Illinois shed hunter had himself one of those ‘never forget’ moments, and will likely be telling everybody about this tom turkey encounter any chance he gets. Joe Galloy is the fella behind the camera in this video, and he found himself in a bit of a pickle while out shed hunting one afternoon.. This behavior isn’t all that uncommon in turkeys this time of year, so I always say keep your head on a swivel when in the woods during early spring. The only other thing I can say is you should definitely take your own advice and get yourself a turkey tag, sir! Have you ever experienced a tom turkey encounter like this before? Tell us all about it in the comments! The post When Turkeys Attack: Illinois Shed Hunter Has Tom Turkey Encounter He Won’t Soon Forget appeared first on OutdoorHub.